UV protection clothing and beach wear that offers an SPF rating, is an easy and often more reliable way to protect your skin from the sun. Better coverage for those hard to reach places like your back, opting for rash guards, swim suit cover ups and uv protection shirts, can be comfortably worn all day in and out of the water. It's not easy to get kids to stay still long enough to apply and reapply sunscreen throughout the day. Water, sun,and sand all breakdown the effectiveness of sunscreen which means it needs to be used frequently throughout the day and even so many times skin will still get a sunburn. That's what makes sun protection clothing for kids so practical. 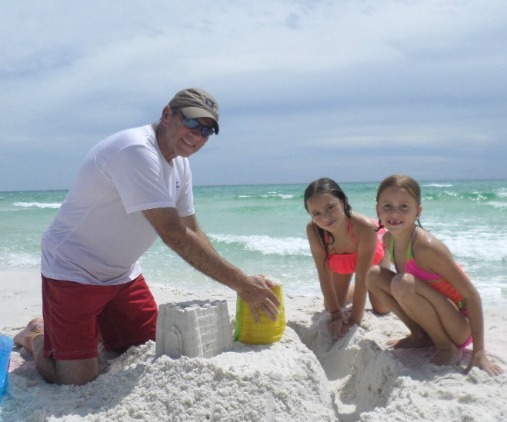 Our granddaughter who didn't want to wear a uv protection shirt the first day of our beach vacation quickly changed her mind after getting sunburned. She made sure she had it on every day and wore it all the time in and out of the water. Baby sun protection clothing, along with a UV protection umbrella, is a must for anyone who takes their baby to the beach. Baby's skin is very sensitive to the sun and can burn so easily even under an umbrella because UV rays can bounce off the sand and water. The guidelines for what age you can apply sunscreen for babies varies and has changed over the years, so check with your pediatrician first. 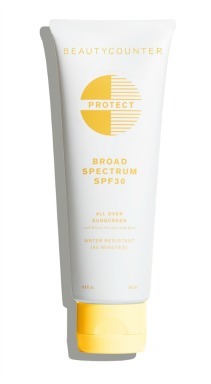 If the doctor recommends using sunscreen be sure to opt for one that uses safer ingredients by checking it out for harmful ingredients at the Skin Deep Database at ewg.org. 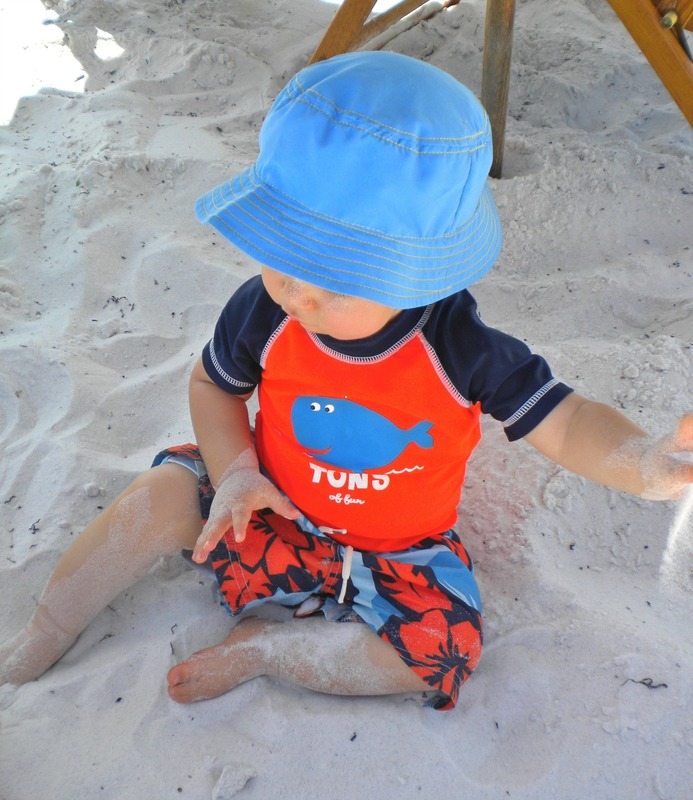 A baby rash guard is a simple solution to protecting a baby's sensitive skin from the sun. They are lightweight and can be worn in and out of the water so you don't need to take it on and off. 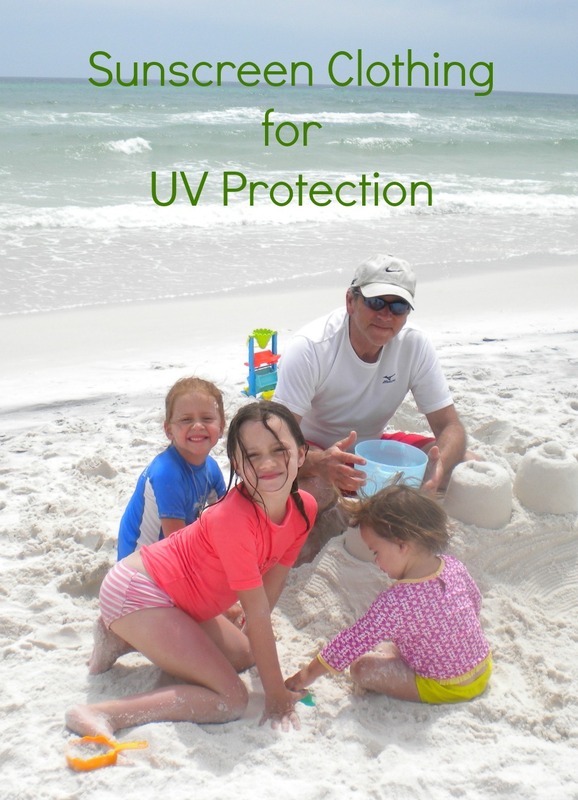 Wearing UV protection clothing at the beach protects the skin better than applying and reapplying sunscreen through out the day - at least for your shoulders, back, chest and arms. Sunscreen lotions need to be re-applied frequently and especially after being in the water. Protective clothing is less messy and greasy. My husband bought a set of two dry-fit T-shirts that he wore every day that has a UPF protection of 50+. 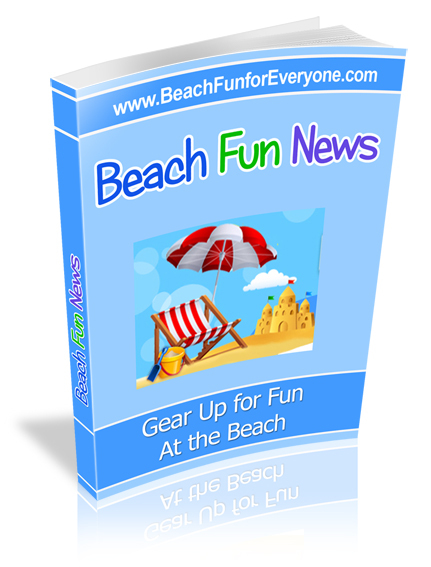 Women, men and children can benefit from wearing uv protection swimsuits and swimwear. A favorite for women is the Coolibar UV protection swimwear line. 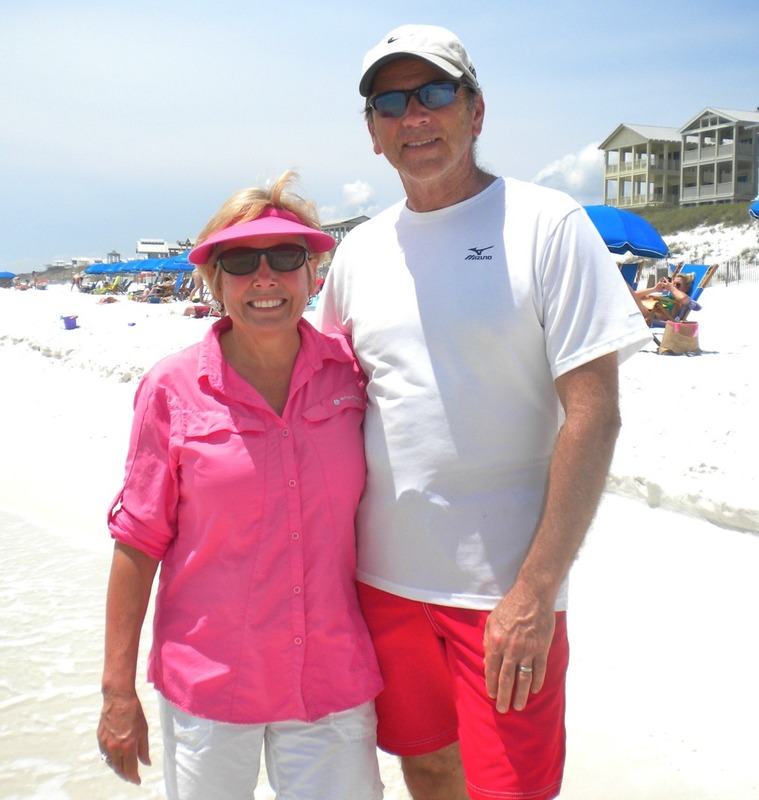 Sunscreen clothing and sunscreen shirts come with us on every beach vacation. 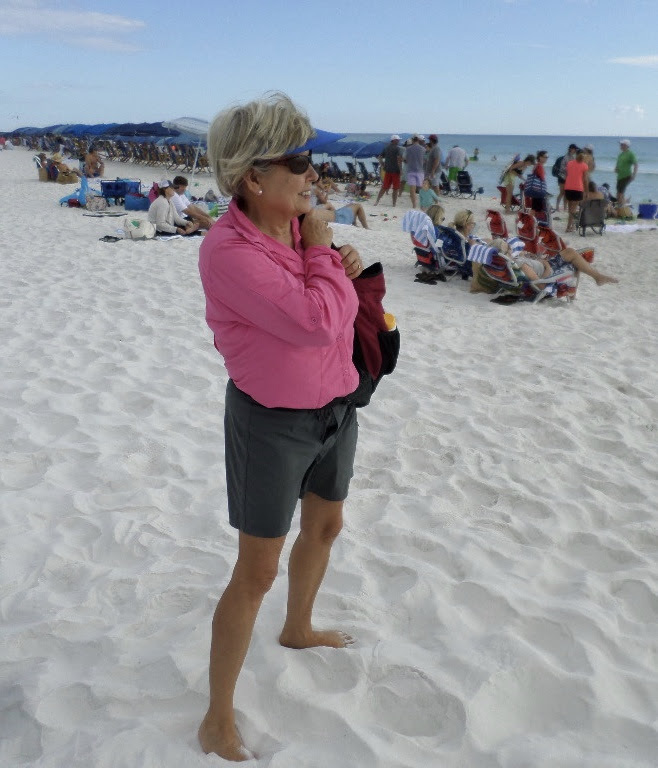 One of my favorite ways to stay protected from the sun is by wearing Columbia shirts with SPF protection of 30+. They come in a variety of colors and I like that they button down so I don't have to pull it over my head. I have them in white, blue and pink. Wear it as a beach cover-up by buying a size up. Hats with sun protection have a wide brim and sometimes a neck flap to protect the sensitive skin on your neck. This is the hat I like to wear at the beach. 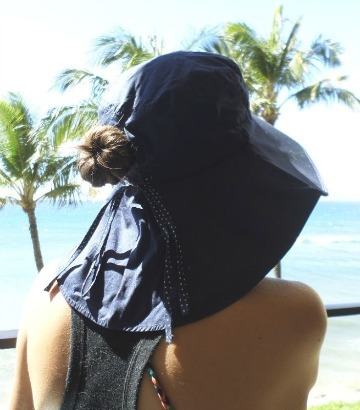 Your hair definitely prefers hats to visors, as it stays better protected from the drying sun and wind. 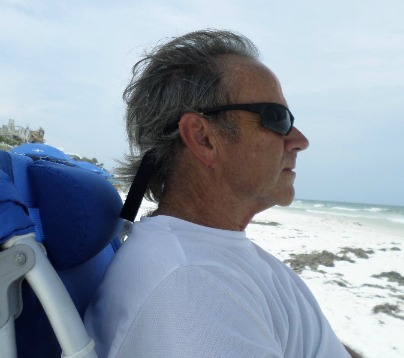 for those with long hair a hole for a pony tail. Of course your uv protection wouldn't be complete without 100 UV protection sunglasses. Look for wrap around sunglasses that prevent UV rays from entering from the sides or from above the sunglasses. Polarized lenses reduce glare that comes not only from the sun but also from the water. We wear our sunglasses in and out of the water, but only when wearing floating sunglasses straps. Here is a pair of Eagle Eyes sunglasses developed by NASA Optic Technology. Combining a polarized lenses with 100% UVA and UVB protection you can see things sharper and clearer than you can with regular sunglasses. Unlike darkly tinted lenses that darken your vision Eagle Eyes sunglasses allow in vision-enhancing light from the wavelength spectrum.